"Oliver's Game can be appreciated by anyone who loves baseball...if you're old enough to hold a bat, you'll like this book. It's a gentle paean to a lovely sport, to a way of life. It's about dreams: dreams lost, dreams regained. It's about learning to live with the pitches you're thrown and remembering that there's always another at bat. Who knows, next time you might hit it out of the park. Matt Tavares certainly did." "Tavares's artwork is notable for its vivid detail and animation. The text masterfully weaves together tradition, perseverance, loyalty, and family lore, and the result will enchant baseball fans young and old." "Tavares's softly focused, sepia-toned pencil and watercolor illustrations take on a credible period quality....The onfield images of Oliver reaching for a ball in left field and at bat are especially well rendered, the emotions palpable....Tavares suffuses his text, his art and both of his characters with a tangible love of baseball." 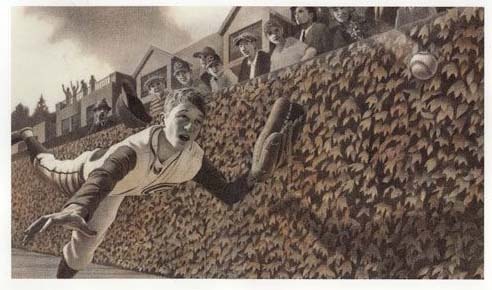 A "tale of baseball dreams passing from one generation to another, grafted to atmospheric pencil illustrations that recall Chris Van Allsburg's early work....An intimate, poignant episode for fans who revel in the game's less tangible aspects." OLIVER'S GAME. Copyright Â© 2004 by Matt Tavares. Reproduced by permission of the publisher, Candlewick Press, Inc., Cambridge, MA.